On the 24th to the 26th of May 2012 the Revit RTC conference was held at the Novotel Wollongong. This presentation was similar to the one I co presented in 2011 on the Gold Coast, however this time it was with Brenden Picton from GHD and it was about the same integration process spoken about in 2011 however this time it was on a live job we were both involved with. GHD engaged Jackson Roxborough on an IPD (Integrated Project Delivery) basis for the purpose of getting Steel Detailing on board early to meet a tight dead line. To enable early engagement and ensure targets were met the process of delivering a 3D model in IFC (Industry Foundation Classes) format was decided as the best way forward. 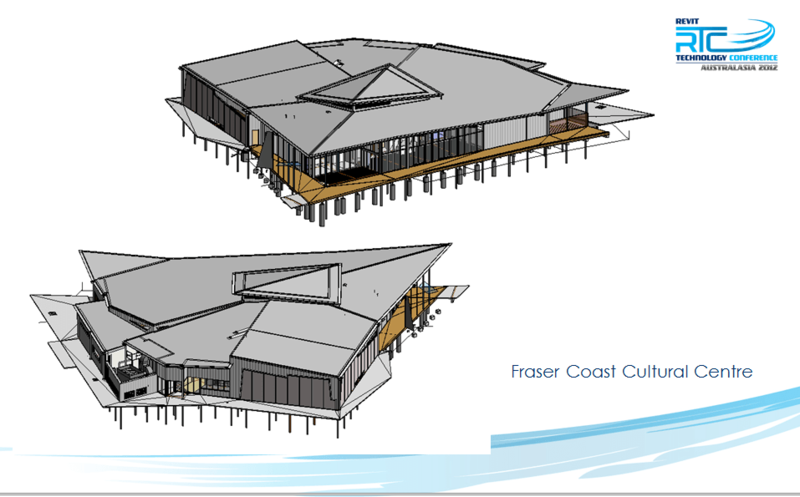 Brenden explained how GHD used Revit to model their building; In this case the project was the Hervey Bay Cultural Center He went on to discuss the IFC export process and how GHD guaranteed this model as their documentation deliverable to JR (Jackson Roxborough). He also discussed some of the pros and cons in using this process from an Engineer’s perspective. It was my turn then to go over the processes JR used to manage the IFC model’s many revisions throughout the Detailing processes. I showed in a live Tekla Structures model how we are able to convert IFC elements into Tekla recognised elements; this is the same process as shown in 2011. There was a bit of a twist with this project, not just in the geometry of the building but in the way we controlled the revisions. Life is never perfect and for most projects there are revisions. When we started the project about 15% of the model was ready for Detailing, to identify what was ready for detailing GHD added a field on the elements which they labelled – ‘Element Finalised’. In Tekla we were able to colour all elements with this field associated and as revisions of the IFC were issued and more ‘Element Finalised’ added, we were able to ensure we were only Detailing what GHD has approved. This project was challenging in both geometry and using processes only dealt with at the time in testing. The results and outcomes for the project spoke for themselves; The builder was very satisfied at the early and abundant delivery of steel work to site and the fact that there were not errors to speak of. Once again there were plenty of questions and interest in this presentation. It was a pleasure to be a part of. Refer to the attached document which is an extract of the presentation. Take note of the clients response at the end!